If you have read anything I've written you will know that I am a big supporter of confession and seeking God's forgiveness. You will know that I've written about God's mercy and how He desires to offer us forgiveness. Sadly, I may have been remiss in speaking how we need to imitate God in our forgiveness for others. In the Bible somewhere (remember I am Catholic and can't be expected to know where stuff is located!) it speaks about how we are supposed to forgive people not just once or twice. Jesus tells us that we are expected to forgive our neighbor "seventy times seven." You will find the number seven several times in the bible and that is because the number has the significance of perfection. So Jesus is not saying we should only forgive someone 490 times and on the 491st time we can say "forget them!" He basically saying we should forgive someone an infinite number of times. As many times as it takes. Jesus is a smart guy. He knows that when we hold anger and bitterness over someone we are allowing that person to hold us captive. We need to be able to let go of our anger and hard feelings over that person so that we can be free. I'm not saying you have to forget and allow yourself to make the same mistake. Don't be a sucker and allow yourself to be taken for a fool. Just because we are supposed to be meek does not mean we are supposed to be punching bags. I would say the most important reason to be forgiving people was pointed out to me in a lecture I heard by Dr. Scott Hahn titled "Understand The Lord's Prayer." In the lecture, Dr. Hahn breaks down the Lord's Prayer bit by bit. He gets to the part of the prayers that says, "forgive us our trespasses AS WE FORGIVE THOSE WHO HAVE TRESPASSED AGAINST US." In the prayer we are petitioning God to forgive our sins but we are adding a caveat. Forgive us God just like I've forgiven that other guy. So if I haven't forgiven that other guy, I should not expect that other guy to forgive me! It's not easy to forgive someone. It may be a daily thing that you have to do. You may forgive Joe today and then tomorrow realize you are still holding on to that grudge. Forgive Joe again. Tomorrow forgive him again and again and again until you've forgiven him 490 times. And then forgive him again. 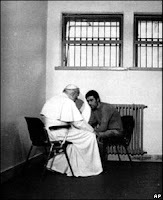 Model yourself after Pope John Paul II who was able to forgive Mehmet Ali Agca, the man who shot him and nearly killed him.